To Love a Rose: Melissa and Doug Sale at Amazon.com! 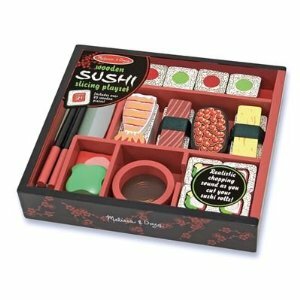 Melissa and Doug Sale at Amazon.com! I love, love, LOVE Melissa and Doug toys! They are always so cute and clever; plus, the paint used to decorate these precious wooden playthings is nasty-child-harming-chemical-free! Like and Like! This is the Melissa and Doug standing easel - so cute! My sisters and I had an easel like this when we were younger and used it ALL the time! It's normally $69.99, but right now it's on sale for $42.99. 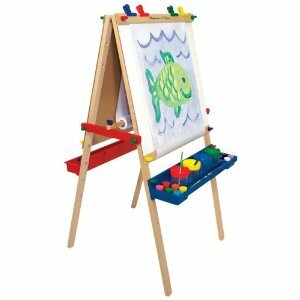 Click Melissa & Doug Deluxe Standing Easel to get one of your own! 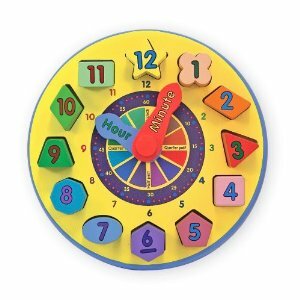 I love that this clock can teach colors, shapes, counting, and time...so neat! Here's the link: Melissa & Doug Wooden Shape Sorting Clock . Used to be to be $14.99, now it's $11.19! Isn't this cupcake set precious?! AND, I believe the "frosting" tubes (aka: markers) allow the child to get creative and decorate their own cupcakes! How fun! 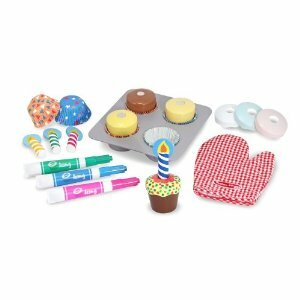 Melissa & Doug Bake and Decorate Cupcake Set This set was $19.99 and is marked down to $13.50. Yeah, and I didn't even show you the wooden stir fry or sushi slicing sets, wooden kitchen accessories, or the grill set! You'll just have to visit their store (link above) to check it all out! Have FUN! More Christmas Designs in our Cafe Press Store! Top Baby Names of 2010! NEW Christmas Cards at our Cafe Press Store!